Have you been thinking about new beginnings and fresh starts like we have? Maybe because spring is almost here and the chill is going from the air, which means we’ve had more time to linger outside and notice the beauty that is all around, we’ve been appreciating the blue sky, the beach, and the flowers that are filling up the flower shops and farmers’ markets close to where we live. We’ve been noticing daisies, wrapped in bunches in plain brown paper or placed carefully into more formal arrangements. Thoughts have been going through our minds about how the daisy perfectly represents innocence and purity, and how it seems like the flower guides us into times that are ripe for whatever happiness we want to create. Daisies bring smiles to our faces, and we’re betting they do the same thing to millions of others. So, we thought we’d share a bit about the daisy to celebrate it and to honor its presence in our lives. The daisy is actually two flowers in one. It’s made up of a pair of different florets, small or flowers, that together give us the illusion of a single bloom. On the daisy, you’ll find ray florets (these make up the prominent petals) and disk florets (these sit at the center of the daisy). The daisy’s composition is called a capitulum, and it’s a composition that the sunflower shares, among other flowers. A common daisy has white petals (or ray florets) and a yellow center (disk floret). But, the daisy’s petals can also be pink, orange, yellow, or rose. The daisy’s stem is smooth and leafless, and it only holds one daisy on it. 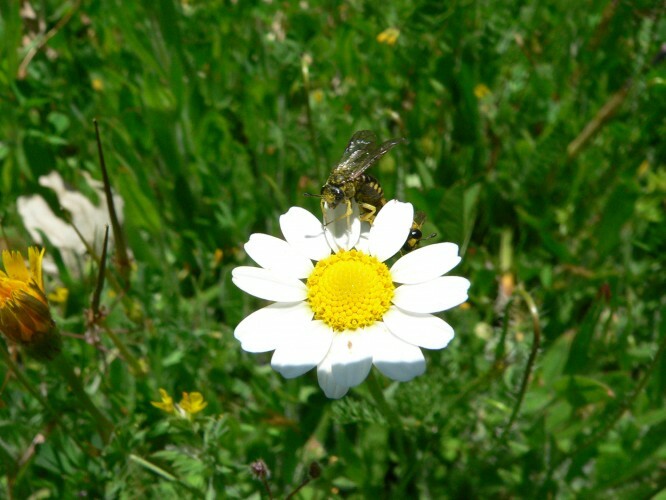 Common daisies have stems that are about three to four inches high. Other types of daisies can have stems reaching twelve inches or so. Daisy leaves grow at the base of the stems. Some of the most popular types of daisies include the common daisy, African daisy, blue daisy, kingfisher daisy, gerbera daisy, butter daisy, sunshine daisy, and giant daisy. Daisies are vascular plants, which means water and nutrients circulate throughout the them. Vascular plants comprise nearly 10% of all flowering plants on the planet. You can find daisies on every continent on Earth, except on Antarctica. The word “daisy” comes from the Old English “daes eag”, which is thought to mean “day’s eye” after the way it opens up at dawn. German botanist Paul Dietrich, close friend to the Swedish “father of taxonomy” Car Linnaeus, classified the daisy family as Compositae in 1972. The daisy’s leaves are edible. You can use them in salads and teas. Do you love daisies? Do you frequently keep them in your home or in your garden? Do you have any stories to tell about your experience with daisies? If so, we’d love to hear from you in the comments below. Have you been thinking about new beginnings and fresh starts like we have? Maybe because spring is almost here and the chill is going from the air, which means we’ve had more time to linger outside and notice the beauty that is all around, we’ve been appreciating the blue sky, the beach, and the flowers that are filling up the flower shops and farmers’ markets close to where we live.We’ve been noticing daisies, wrapped in bunches in plain brown paper or placed carefully into more formal arrangements. Thoughts have been going through our minds about how the daisy perfectly represents innocence and purity, and how it seems like the flower guides us into times that are ripe for whatever happiness we want to create.